Are you planning a brunch or get together for this upcoming Father’s Day? 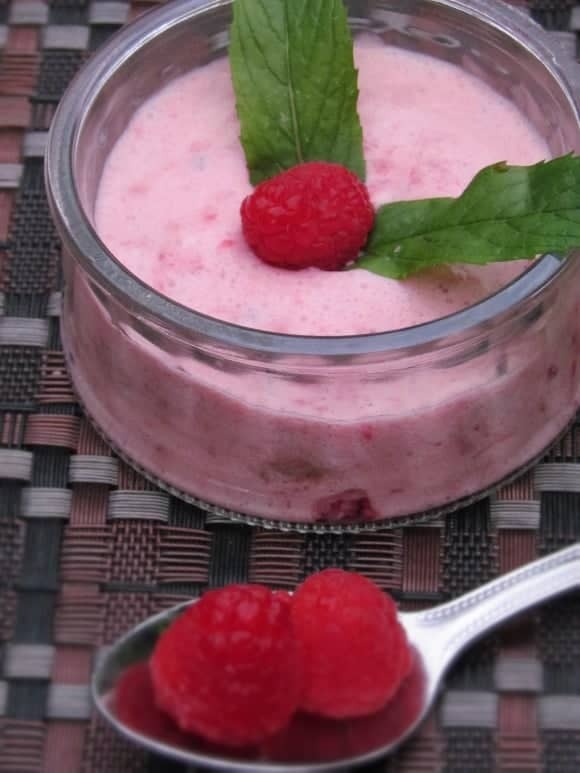 This raspberry mousse low-calorie dessert recipe is a must! It’s easy to prepare, very low in sugar and most of all: delicious! This fruit dessert recipe is perfect for people who suffer from diabetes too. As you may have noticed, I like fruit dessert recipes! They are healthy yet still so incredibly delicious and naturally sweet. They also make great low-calorie dessert recipes! While I love mixed berries, like those in my Wild Berry Bavarian, raspberries are one of my favorite fruits, as you can see in my Raspberry Clafoutis Recipe. 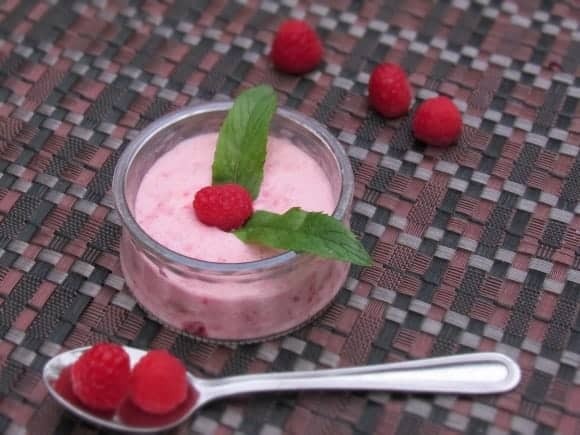 This Raspberry Mousse recipe doesn’t just taste amazing; it’s also quite beautiful on your table! Perfect for when you want to make a great impression on your guests! Four egg whites. You can use the egg yolks towards a pudding recipe. In a separate bowl, beat the egg whites. For better results make sure that your utensils are cold! Beat until it is white and thick. Slowly add the raspberry mix to the beaten egg whites. It is a delicate operation SO do it carefully, slowly and gently until everything is mixed. Pour the mixture into some pretty dessert dishes and decorate with raspberry and some fresh mint. This dessert is best when served right away. You can refrigerate it, but the freshness of the ingredients comes through when you serve it right after preparing it. I hope you enjoy this delicious fruit dessert recipe! It’s the perfect end to your Father’s Day brunch, or for any special occasion. 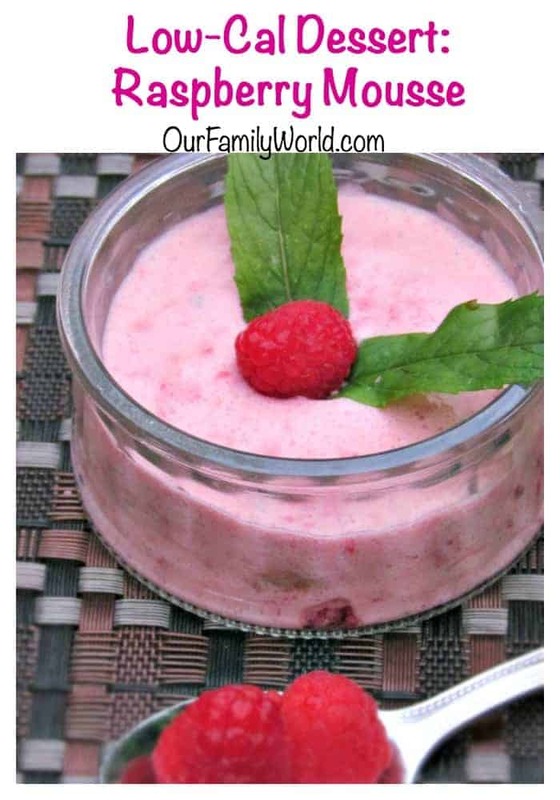 I adore raspberries and this looks super yummy! Thanks so much for the recipe, we’ll be enjoying this in the summer! What a lovely and delicious dessert! Thanks so much for sharing your awesome recipe with Full Plate Thursday. Hope you are having a great week and come back soon! Visiting from Full Plate Thursday! This looks delicious! I can’t wait to try it! This looks wonderful! I am going to have to grab some raspberries at the store this week. Please come link up at Tickle My Tastebuds Tuesday! Great recipe, I tried making taro mousse last week but failed unfortunately. This looks so tasty ! I just love everything with raspberry! And if it`s low calorie dessert it`s even better! I am a sweet tooth and I love desserts so finding ways to eat desserts and cut back on sugar is a must for me. I love raspberries. This looks so pretty and delicious. Thanks Heidi. It is delicious. This looks yummy, thank you for sharing. Thanks Christy. I love desserts and especially fruit ones.